Because of the nature of the terrain, only experienced backpackers / canyoneers should consider this trip. We were there on one of the busiest weekends of the year, and did not see any other people, except for at either end. If you have any doubts about this trip or your ability, do not attempt it. This is a very challenging trip. Though we did it in only three days (two nights), it is probably best to plan more time to get through. (We barely made it out on the third day after 11 hours of almost solid walking). There are no good evacuation points aside from the beginning and end of the canyon. If you were to become injured it might be up to you to get yourself out. This trip requires that cars be left at both ends of the trailhead ( Gisela and Little Green Valley ). 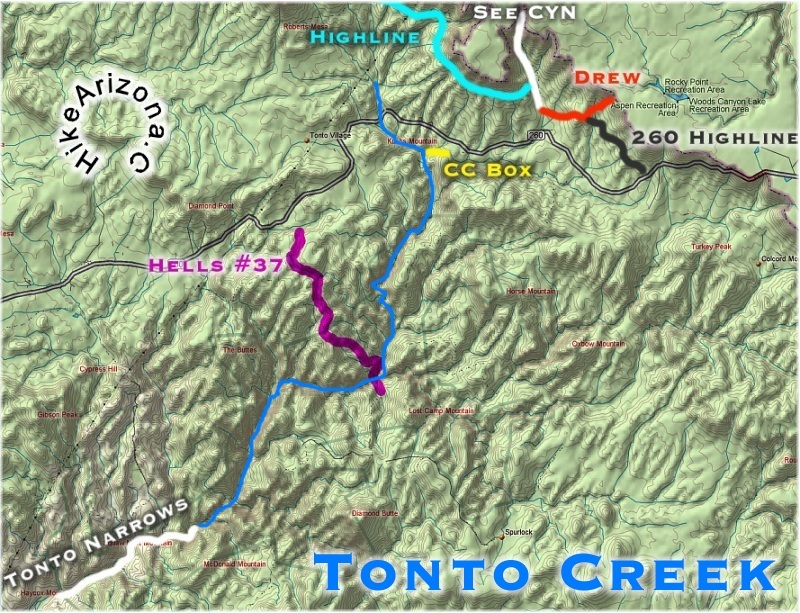 This trip report actually begins at the confluence of Tonto Creek and Haigler Creek and follows Tonto Creek 17 miles* to Gisela with an elevation loss of 1000 ft. For instructions to the confluence please see the Hellsgate trip description. At the beginning of the Hellsgate trail there was a warning sign, which advised that the trip was best done with at least 4 people and that there is a 15-foot drop-off that might deter one from reaching Gisela. Duly warned, we pressed on. Departing about 9:30, we arrived at the confluence at about noon and had lunch. This is where the trip really starts. Almost immediately the canyon begins to constrict and the wading turns into swimming, which was a welcome event after the toasty hike into Hellsgate. The sheer Granite and Ryolite walls of this canyon are beyond description. This is a true wilderness experience. Any small area of this canyon would be worthy of an all day hike just to reach THAT area. We saw miles and miles of awesome canyon beauty, with not a footprint in sight. We hiked, and swam, for several hours (approximately 3 miles) until we found a smooth outcropping of granite, suitable for our nights' camp at about 4:45. The next day we spent almost 10 hours (approximately 6 miles) walking, swimming, falling, and crawling through more granite-walled pools until we decided on a nice, but sandy, campsite. The canyon through this area vacillates between Granite gorge and a Sycamore lined creek interspersed with cattails and other riparian delights. The third day brought us more swims, and around one bend the canyon opens up a bit giving us the feeling that the trip was ending. But just when we were resigned that our adventure was coming to a close, (and dreaming of juicy burgers) the canyon dealt us one more awesome set of smooth, white granite narrows. At about the 13-mile mark, (remember that is from the Tonto/Haigler confluence) were two waterfalls, each at least 15-feet high. The first one was easily avoidable by a short climb down on creek left and then a four-foot drop into a pool. To descend the second there were two or three options; a large, steep slide into a narrow, deep pool at creek left. Two, there was a climb down the front of the fall. Third, if someone were to go ahead and "probe" these pools, "hucking your carcass" would be the simplest and most expeditious decent of these falls. After these narrows and falls the canyon still has some nice swimming holes, but basically the canyoneering is finished. This last day we slogged on for nearly 11 hours (approximately 9 miles). In summary, throughout the trip we averaged about 10 swims per day; some were over one hundred yards long. When we weren't swimming, we were wading or rock-hopping. Many of the pools could be avoided by climbing along the sides, however some of the surfaces were extremely slick and extreme caution was required. This was especially true of the drop-offs mentioned in the ranger's sign. The canyon was very rugged and there are no trails. Fortunately the canyon is easy to follow; all you have to do is keep going downstream. For instructions on how to get back to the parking lot at Gisela see the Tonto Narrows trip description Special Gear:Backpack: There were several different varieties of packs used on the trip all with there own merits. I used an internal frame pack with waterproof liners. I wore the pack even while swimming and found it works as a sort of raft, by leaning back on it you could just float down stream. The only restrictive part was carrying the extra water, which inevitably found its way into the pack. If I do this again I would have four grommets put in at each corner of the pack to allow water to drain out after leaving the pools. Jackie had a 3500 ci. Boundary Bag (basically a waterproof, rubber backpack). It stayed watertight for the whole trip, took on zero water and subsequently did not need to be "emptied" after each immersion, which were quite frequent. The underlying cobbles in the creek are extremely slippery, so a lot of the time it was easier and safer to just walk pulling your pack along in the water by a rope "leash". This leash also is another good way to tow your pack behind you while swimming the pools. Kurt used a drybag inside his internal frame pack and had the same experiences as me, whereby things stayed dry, but he had to empty his pack of water after each immersion, which, as stated above, is very frequent. Additionally, the fabric and padding of the pack, when it becomes wet, adds pounds to the pack. This is a trip to go ultralight. Another option, which seemed to serve Pete well, was to put his inflated Thermarest in-between his pack and a rainfly, this method was outlined in Pete's topic, Pack floating solution. Jims external pack arrangement is also discussed in this forum. As conditions will demand that you to be relatively rough in the treatment of your pack during this trip, Zip-Locs used in your pack WILL LEAK; do not depend on them; especially regarding electronic gear. Suitable tent spots in this beautiful canyon are very scarce. As you should being doing this trip in warm weather, with light, or no, rain forecast, a ground cloth/tarp will more than suffice in most cases. Shoes: I wore a combination of sandals and water-shoes over the course of the trip. I would strongly recommend against this. Most of the others in the group wore lightweight boots or tennis shoes and seemed much more comfortable. As a lot of the hiking/scrambling is on cobbles, it makes sense to have your ankles protected. The boots will be a bit more cumbersome in the swims, but your feet will thank you. Try and use boots that have soles with a high carbon content (i.e. - Teva's "Spider Rubber") to improve grip. HAZ adds: Not a map of the hike. However, if you can't figure it out from this... you shouldn't go!